The snow-capped Nevado del Huila volcano (fig. 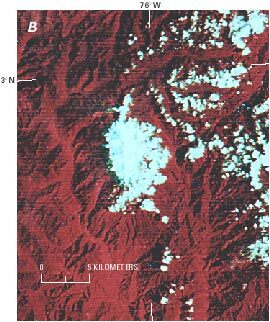 14), which rises to 5,750 m above mean sea level, supported a snow- and ice-covered area of 26 km2 measured on a 1976 Landsat image (fig. 15A, B). Early maps (Vergara y Velasco, 1892) compared to the 1976 Landsat image (2375-14353; 1 February 1976) suggest little change in snow cover during the last 100 years. However, no reason exists to believe that this mountain constitutes an exception to the general trend of glacier recession in the Colombian Andes. In fact, Reiss and Stübel (1892) reported the terminus of a large glacier at 4,337 m and the snowline at 4,484 m, whereas an Ingeominas (1984) report locates the limit of the glacierized area at about 5,100 m. These figures indicate that the snowline and glacier termini have receded similarly to, although at a higher rate than, other glacierized areas in Colombia. If these figures can be reliably compared, they indicate that the rate of average glacier retreat in this area amounted to more than 8 m a-1 between 1892 and 1984. Figure 14.--Nevado del Huila seen from the southeast. Photograph courtesy of Villegas (1993). 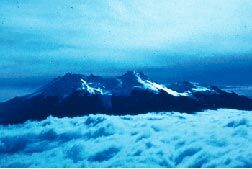 Figure 15.--Glaciers and snowfields of the Nevado del Huila. A, Area of glaciers and snowfields, shown in green, calculated from a Landsat 2 MSS image acquired on 1 February 1976. B, Enlargement of northeastern part of a Landsat 2 MSS false-color composite image (2375-14353; 1 February 1976; Path 9, Row 58) from EROS Data Center, Sioux Falls, S. Dak.